Sir Cliff Richard is to release an album on Decca records, 46 years after they passed up the chance to sign him. Something's Going On, Sir Cliff's first studio album for three years, will be released on 1 November and features two collaborations with Bee Gee Barry Gibb. Sir Cliff says he has had a "new lease of life" after signing for Decca, who refused the singer in 1958 prompting a 40-year relationship with rivals EMI. Decca also famously failed to sign the Beatles in the early 1960s. Costa Pilavachi, president of Decca Records, said the new album is "exciting" and full of "great songs". "We may not have signed him back in 1958 but it's never too late to correct a mistake - and we're very excited to welcome Sir Cliff Richard to the Decca family in 2004," he said. Something's Going On, the title track from the new album, will be released as a single in October. Sir Cliff is also planning to release a live DVD of concert performances from his recent UK Summer Nights tour of stately homes. 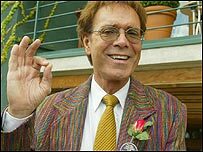 "The enthusiasm and confidence which everyone feels about my new album has given me a new lease of life," said Sir Cliff.